Another day, another victory for Johanna Konta. Fresh off the heels of her nearly perfect upset of Serena Williams Tuesday night, the 2016 Mubadala Silicon Valley Classic champion was back at Stadium Court in San José Wednesday afternoon to face another American, 19-year-old Sofia Kenin. The British star rolled to a win in straight sets, 6-1, 6-4. The serve was strong again for Konta, collecting nine aces while winning all nine of her service games. Her quarterfinal opponent, fourth-seeded Elise Mertens, also won in straight sets, 6-2, 6-0 over Ashley Kratzer. Konta beat Mertens in their only other meeting, 6-2, 6-1 in the second round of the Miami Open earlier this year. In the top half of the singles bracket, Victoria Azarenka beat Anna Blinkova in straight sets, 6-1, 6-0. Azarenka, who played for 2 hours, 40 minutes in her first round encounter with Kateryna Bondarenko, won in just 58 minutes. Blinkova, who lost in three sets to Amanda Anisimova in the second round of qualifying, was added to the main draw as a lucky-loser in place of Garbiñe Muguruza after the top seed withdrew from the tournament earlier in the day. Danielle Collins was the other winner on Day 3, and the only one to do so in three sets, in a back-and-forth affair with Vera Lapko, 6-1, 3-6, 6-1. Wednesday’s sessions also saw the last two quarterfinal spots of the doubles draw decided. Both matches went to super tiebreakers, as the pair of Miyu Kato and Makoto Ninomiya came back and defeated Magdalena Frech and Maria Sanchez, 1-6, 7-5, (10-4), and the third seed of Lyudmila Kichenok and Nadiia Kichenok won the last match of the evening 4-6, 6-3, (10-7) over Kaitlyn Christian and Sabrina Sanataria. Friday will see Kato/Ninomiya play Garcia Perez/Hon, while the Kichenok sister will take on Blinkova/Dzalamidze. In matches to come on Thursday, #2 seed and reigning Mubadala Silicon Valley Classic champion Madison Keys will play her first points of the 2018 tournament when she takes on Ajla Tomljanovic tomorrow afternoon. In evening action, #3 seed Venus Williams will take to Stadium Court for her first match of the tournament, facing Heather Watson. 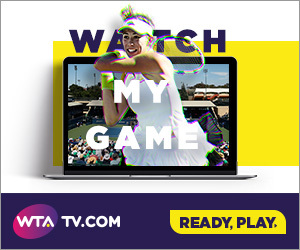 The tournament’s youngest remaining competitor, Amanda Anisimova, looks to advance into the quarterfinals when she takes on #5 seed Mihaela Buzarnescu, and #8 seed Timea Babos will play Maria Sakkari.